New Sculpture Department participated at Coup de Ville 2013. This text was published in the catalogue. The variable collective, New Sculpture Department (NSD), was created in 2011, when Kees Boevé and Lorenzo Quintanilla met one another at the Gerrit Rietveld Academy in Amsterdam. At the time, they both decided to specialise in ceramics – not out of a conviction about this specific medium, but because of the lack of a sculpture department. The fact that a work of art did not need to be more than a good idea with a technically average execution rubbed Boevé and Quintanilla the wrong way. As a ‘shadow department’ within this education programme, they put together their own curriculum in order to arrive at a better insight concerning the history of sculpture, knowledge of materials, construction methods... Therefore, DSM wanted to stand for well-made work with decent theoretical investigation of the concept. After their studies, they sought to continue in sculpture; as a collective they are open to collaboration with others. According to the project or the situation, they have worked together with artists from different backgrounds, disciplines and nationalities. 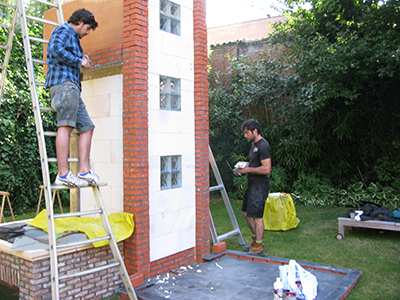 For this occasion, they worked together with Belgian artists Sven Boel and Kasper De Vos. They worked together under one flag without highlighting an individual. Additionally, they also present themselves as individual artists, in which their own work is developed. 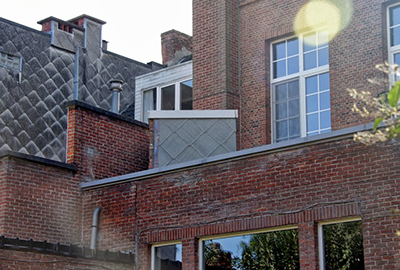 Inspired by a faceted back wall – originally a school, now a residence housing a group practice of physiotherapists – the New Sculpture Department focused on a Flemish architectural phenomenon: the shed. It concerns the organic spread of additional construction volumes at the backside of homes, consisting of stacked storage spaces, sheds, (animal) cages, work areas and related constructions. This construction mentality has currently found its successor and variation in a range of (standardized) hobby greenhouses, verandas, pergolas, garden sheds or arbours. 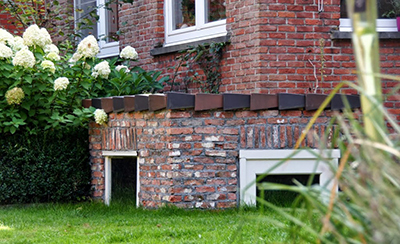 In residential construction and spatial planning there appears to be a striking difference between neighbouring residential environments such as Flanders and the Netherlands. In her original master’s thesis from 2012, architect Sanne Geldof even polarises this difference as ‘exotic’ versus ‘ordered’. The ancient Greek cultural opposition of ‘Apollonian’ (measure, order, rationality) and ‘Dionysian’ (excess, chaos and, irrationality) also applies here. 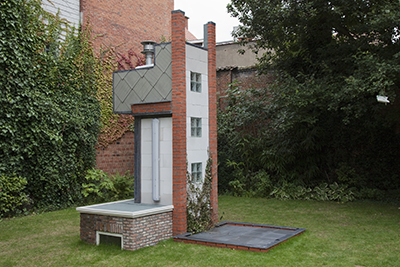 In any case, the cliché would have it that in ‘the Southern Netherlands’, an impulse-driven, self-build culture predominates, where everyone tinkers their own palace together – a desire that the New Sculpture Department readily admits.